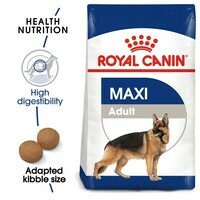 Royal Canin Maxi Adult Dry Food for Dogs is a complete diet for adult large breed dogs over 15 months of age and weighing 26 to 44kg. Developed to meet the nutritional needs of large breed dogs, the food has been made with only high quality ingredients including vitamins and minerals. High Digestibility: Helps to promote optimal digestibility thanks to an exclusive formula including very high quality proteins and a balanced supply of dietary fibre. High Palatability: Satisfies the appetite of large breed dogs thanks to carefully selected flavourings. Bone & Joint Support: Helps support large breed dogs’ bones and joints placed under stress. Omega 3 (EPA-DHA): Enriched formula with Omega 3 fatty acids (EPA-DHA) to help maintain a healthy skin.